Today, the subject of corporate ventures and related maneuvers does not inspire many executives, especially in the conservative cultures that often exist within machine builders and equipment manufacturers. We believe that like a pendulum swinging, corporate ventures suffered a bad reputation starting as far back as the run up to the Internet bubble burst in the 1990s. However, because the many challenges associated with embracing digital and Smart Systems technologies are now clearer and better understood, we believe the pendulum is likely swinging back. 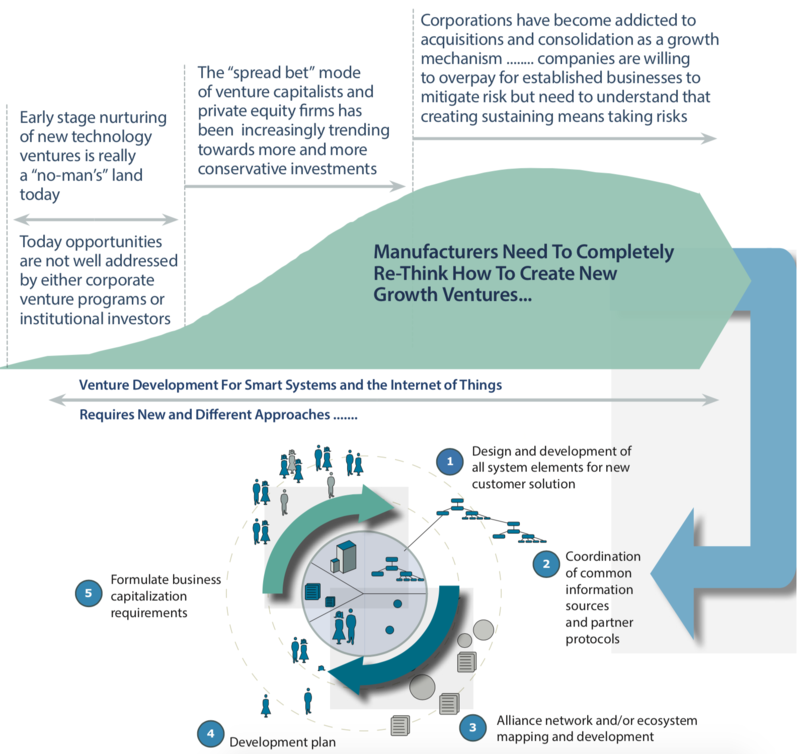 If OEM management teams will need to live in two distinct contexts – running their core business as efficiently as possible while also being able to identify new and novel product and systems innovations, then it is very likely we have entered a chapter in the marketplace where non-traditional growth ventures and vehicles will become more common. Global expansion; re-engineering; lean practices; mergers and acquisitions. For most OEMs these strategies for growth and value creation have reached the point of diminishing returns. As networks continue to integrate the physical and virtual worlds, what worked in the past to drive new growth is less likely to work now or in the future. To stay competitive, OEMs will need to sustain momentum in their core business while developing new digital and IoT capabilities, offerings and business models. The assumption that the primary role of an equipment manufacturer is only about sustaining their core product business no longer works. We believe OEMs need to think seriously about new more autonomous ventures and growth vehicles for smart systems innovation. OEMs need to think about new growth businesses in a manner that transcends their core products or services. OEM business strategists need to creatively imagine fully developed application solutions, ecosystems and whole marketplaces.